Chameleons often bring to mind the ability to change colors to match their surroundings, but they have another amazing ability. These lizards have extraordinarily long, sticky tongues that shoot out at what seems like warp speed to catch insects for dinner. Their tongues use a complicated muscular system to uncoil almost faster than you can blink. When you stick out your tongue, it's unlikely to be long enough to even touch your nose. A chameleon, on the other hand, has an extremely long tongue. It typically stays curled up like a rope in his mouth, but when he lets it loose, the tongue can stretch out to about twice the chameleon's body length. This helps him snag unsuspecting insects from so far away that they never see him coming. Reaching prey from afar isn't very helpful unless you have some way to retrieve it. 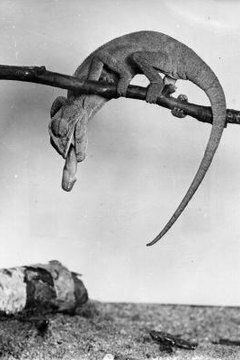 This is where a chameleon's sticky saliva comes in. It coats the thick end of the tongue so when the tongue touches a bug, the bug is immediately stuck. When the tongue curls back into the chameleon's mouth, the insect gets dragged in there as well before it can wiggle free. The most impressive feature of a chameleon's tongue is how fast it shoots out of his mouth. In less than a second, his tongue accelerates to more than 13 miles per hour until it snags its meal. It retracts slower than it shoots out, but there's no need for stealth when the tongue is on its way back in -- it just needs to make it back before the bug can worm its way loose. Chameleon tongues have a specialized system of muscles that help it shoot out and retract. There's a bone in the base of the tongue to anchor the muscles, as well as collagen tissue that basically works like springs. When the long accelerator muscles contract, the retractor muscles relax. This combination presses the accelerator muscles against the collagen springs, which gives the tongue amazing speed as it shoots out of his mouth. After reaching the insect or the end of its length, the accelerator muscles relax while retractor muscles go into action to reel the tongue back in. Scientists continue to study the chameleon's tongue mechanism to learn more about improving movement in robotic designs. School Tube: The Chameleon's Tongue!